In every instance, the student rushed out the door to get across campus, only to encounter a man slumped in an alley, head down, groaning and coughing—an actor placed in the student’s path by the psychologists. One by one, these religious men, who had just read and prepared a lesson on the parable of the Good Samaritan, were put in a position to practice what they planned to preach. We all probably wonder how we would have reacted in the same situation. While none of us has the physical or emotional resources to meet every need we encounter, neither should we be blind and unfeeling toward those around us who are suffering. We can’t do everything, and doing good deeds is not the same thing as knowing Christ, but all of us who claim to know Christ should be doing something. Has God used you to serve others lately? If not, perhaps you should consider the following suggestions. Be aware of the tyranny of time. In the study cited above, the number of students who stopped to help increased to 65% when the participants were not told that they were late. This is still a dismal percentage, but it does illustrate how we can be distracted from the needs of others when we are in a hurry. Are you always in a rush? Then take extra care not to miss the opportunities for one-to-one service God places in your path. Two friends of mine on the way to church happened onto a driver stuck in the mud at the side of the road. Instead of passing by, they stopped to help him. They freed the driver, but were covered with mud in the process and ended up going back home instead of to the worship service. When they told me about it later, though, it was with shining eyes and excitement. They had great joy in this unexpected opportunity to express compassion to a stranger. Try to look past the crowds. Jesus ministered to individuals even when in a crowd of people. Remember blind Bartimaeus, calling for Jesus from the edge of the crowd? Or the woman with the issue of blood—Jesus stopped in His tracks to engage her, knowing that she was full of faith but too embarrassed to entreat Him directly. Ask the Holy Spirit to make you aware of needy individuals in the groups you encounter—the depressed man sitting alone at the back of the room or the child who looks frightened, or the woman with her head lowered, unable to make eye contact with anyone. Jesus didn’t allow the social mores of the day to dictate His behavior. 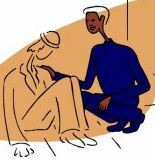 His disciples were shocked to find Him talking with a Samaritan woman at the well at Sychar, and Jewish leaders criticized Him for eating with tax collectors and sinners. Don’t allow yourself to overlook someone who needs to hear the Gospel or needs your help just because they are different—older than you or much younger, of a different religion or unchurched, from a different income bracket or nationality. Go out with a loving mindset. Don’t just wait for opportunities to demonstrate love—look for them. Ask the Holy Spirit to point out someone who needs to hear the Gospel today, someone who needs encouragement, or someone you can help with a physical need. Expect that God will offer you opportunities to put Jesus’ words and example into practice every day, and your opportunities to serve will increase dramatically. Copyright © 2006 Susan Verstraete. >How Do You Recover From This?